Other Products by Horleys. Search other Acetyl L-Carnitine products. Acetyl L-Carnitine is L-Carnitine that has been acetylised (had an acetyl group attached) and is involved in many metabolic processes including the oxidation of fatty acids. 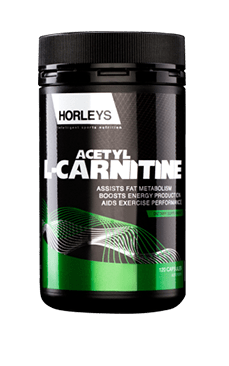 Horleys Acetyl L-Carnitine provides a transport mechanism for these oxidised fats to be taken into the mitochondria of the cell to be used as a fuel source for working muscles, enhancing the body’s fat burning potential. Acetyl L-Carnitine has the additional benefit of being able to cross the blood-brain barrier so can also benefit memory and cognitive function. The acetylised version of L-Carnitine can assist workout performance and fatigue by donating its acetyl group to the Krebs cycle for energy production. One of the common issues we run into with capsules and tablets is the sheer amount you have to take to get a proper dosage. Not with Horleys acetyl L-Carnitine though. The beauty of acetyl l-carnitine is that the therapeutic dosage is quite low compared to other amino acids. You only need 1.5 to 2 grams of this amino acid daily to experience the full benefits. This is as easy as 3 or 4 capsules. We were certainly impressed with this product, and believe it lives up to the clinical trials. One study comes to mind, a comprehensive meta-analysis of all previous clinical trials. They showed that supplementation with this product generally leads to an extra 1.33kg of fat loss. This was published in Obesity Reviews in 2016. For best results take 2 capsules of Horleys Acetyl L-Carnitine first thing in the morning with a glass of water. Take another 2 capsules 60 minutes prior to exercise, or if not training just take your second dose on an empty stomach mid afternoon.